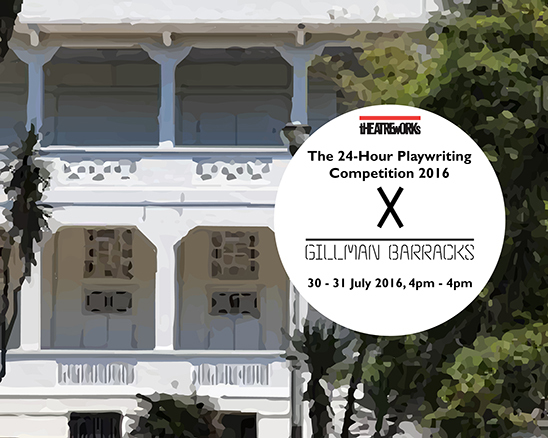 Art, history and heritage come together to form an inspiring backdrop for TheatreWorks’ 24-Hour Playwriting Competition 2016! Held at Gillman Barracks, this year’s venue is a cluster of pre-war colonial buildings that were built in 1936. Once housing the British army, it became the site of a fierce battle as one of the last British posts to fall to the Japanese in 1942 – before being sold, in 1971, to the Singapore Armed Forces as a training ground for a grand total of $1. Today, the ground’s military barracks have been transformed into a swanky arts centre, comprising an enclave of cool contemporary art galleries. Come along for a tour of the space and find out facts as well as real-life stories of this historical venue. Immerse yourself and let your writing be inspired by the unique blend of art, history and heritage of Gillman Barracks. One of the winning scripts from this year’s competition will be developed into a full production that will tour the South East District in the first quarter of 2017. Have an idea you can’t get out of your head? Here’s your chance. Join now and start writing!